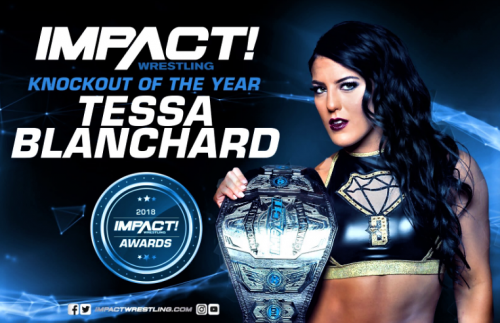 Tessa Blanchard may have been born into wrestling royalty, but the Impact Knockouts Champion has taken nothing for granted, and has earned the right to be called one of the best in the world. Being a third-generation wrestling princess is a lot harder than it might sound. It involves early mornings at the gym, countless hours on the weight machine, and tons of bumps on the mat. It entails gallons of sweat, miles on the road, and many a sleepless night. Born into a grappling dynasty, Tessa Blanchard might be as close to ring royalty as it gets. The 23-year-old, Impact Knockouts champion took the company by storm when she arrived last year, with most observers now agreeing that she will be a surefire, ‘franchise player’ in women’s wrestling for a long time to come. She finished off 2018 with not only championship gold, but several other accolades, including being the Impact Knockout of the Year and ranked on Sports Illustrated’s list of the Top Ten Female Wrestlers. For the up-and-coming star, it capped off a major step forward in her career, where she truly lived up to her label of being UNDENIABLE. Of course, she knows she’s had some advantages along the way. Not many youngsters starting out can turn to two Hall of Famers for trusted advice. Being the daughter of Tully, and also having Magnum TA as her stepfather, certainly gave her an early insight into the business that few others can boast. And, she also acknowledges that having the name, ‘Blanchard’ certainly carries along with it some cache – going back to the days when her grandfather, Joe, was the promoter of the San Antonio territory. But from the beginning, she was determined to carve her own path. These days, the only pampering this princess gets, is cold steel and coarse canvas. She says it’s the price she pays to keep her edge, as she continues to evolve into one of the best all-around workers in the world. Combined with her chiseled features and icy glare, Tessa has a strong screen presence, and is simply impossible to ignore when she’s on camera. Everything – from her walk, to her cocky smile, to her devilish wink – exudes the mature confidence of a veteran. When Blanchard made her debut in Impact Wrestling last May, she quickly cultivated her profile, turning from a prospect, to a bona fide star and someone that company could build their Knockouts Division around. However, standing in her way this Sunday will be the well-traveled veteran Valkyrie. Blanchard knows it will be a stiff challenge, but Her Highness of Heeldom is confident she will leave the world-famous Asylum with her crown. Retired Impact Hall of Famer Gail Kim will be the special referee for the match-up, and Blanchard had some thoughts on her involvement, as well. From there, she says she will continue to build upon not only her family’s legacy, but also her own. For Blanchard, every day is another step in the arduous process of carving out her own place in history.